Sandy Seff was always intrigued by the colorful glass bottles on the window sill at her childhood home. After studying abroad in Spain, the enduring beauty of European art glass planted a seed that would bloom later in life. In 1989, she began pursuing her creative passion...art glass. Her inner passion and creativity motivate Sandy to challenge herself artistically and technically in this fascinating media. She passes on her passion and knowledge to her daughter, Kathy, who comments, "I've learned from one of the best! From her technical skills to her fearless attitude towards glass, my mom has an amazing knowledge of and creativity in glass." Kathy Seff is a second-generation glass artist, growing up with glass art being created by her mom in the home studio. After earning a degree in graphic design and working her way up to art director at an advertising/print company, she decided to become a freelance designer and began her own business in graphic design. All along the way she was working with her mother designing and creating in glass. Now, she works and creates at Colorful Visions full time working on custom art glass and retail pieces for the gallery. Along with her mom, Sandy, Kathy has studied with renowned American glass artists. 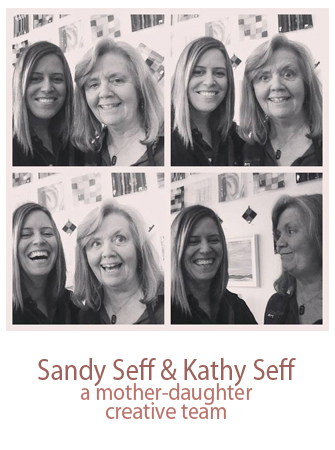 However, it is her mother that Kathy credits for her zeal, enthusiasm and knowledge to create in this amazing medium. "I am constantly amazed at Kathy's creative imagination. She carries out her ideas with the expertise of a true artist," explains mom, Sandy. A peek into our creative showroom located in Bayport. Creating custom art glass, whether stained glass or kiln/fused glass is our specialty. We can help you zero in on your style and glass selection. We offer FREE In-Studio Design Consultations so stop in and bring your tile, paint chip, photo of interior... or just a measurement and we will guide you through the entire process from concept to installation.